A professional custom web development company giving web design services and web hosting service at affordable rates in USA and Pakistan. The web server with the IP-address 50.23.14.227 used by Citruswebdesign.net is owned by digitaldemonz.com and is located in Dallas, USA. The website Citruswebdesign.net has a own web server. The web server only runs this website. 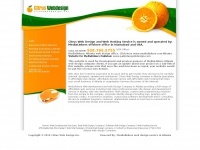 The websites of Citruswebdesign.net are hosted by a Microsoft-IIS server and were developed in the programming language ASP.NET. The markup language of the website is HTML 4.01 Transitional. Both the inclusion of the website in search engines and follwoing of its hyperlinks is explicitly allowed.